Through enemy attacks, blizzards, and mud young men on horseback delivered the U.S. mail for eighteen months. “Mr. Russell, you’re dangerous! You risk thousands of dollars and schedule the probable death of young men. Your project is trapped in arguments between the North and South over slavery. And, your plan for getting U.S. mail rapidly across the U.S.—impossible! “By next year, 1861, the United States will probably be ripped apart by war. Even if, by some miracle, war waits; your Pony Express cannot accomplish what you are promising. You claim that horseback riders can race across the West carrying U.S. mail on swift horses. They will travel 1,966 miles in ten days. Impossible! “Mr. Russell, I need more information. How can I convince senators to vote to pay $500.00 for every round trip your riders make biweekly to and from St. Joseph, Missouri and San Francisco, California? “I agree our mail service in the West is slow, very slow. I know it takes about a month for a stagecoach to cross the West when the weather permits. However, your time schedule is unrealistic. “Senator, you have not experienced the West. You have been listening to possible problems for the Pony Express. Remember you are an outsider. In the West people learn survival skills unknown to Easterners. In the West young men often work outside. They understand horses. Men know the deserts, mountains, and plains. People develop stamina, skill, and courage, or hobble along. 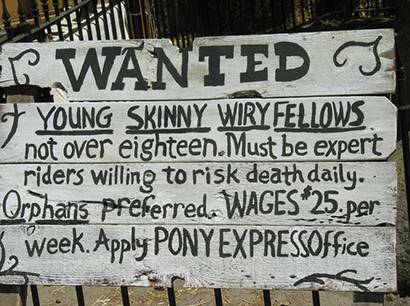 “We will hire about 80 Pony Express Riders. Each man will weigh about 120 pounds. We’ll get fast tough horses, mustangs. Each rider will commit to taking the mail a set distance and time. It is a trip for men determined to get the mail through to its destination. This is Barbara Steiner. I anticipate sharing exploits of the Pony Express Riders. Their bravery and the dangers they survived are astonishing! Each week go to the website thisweeksstory.com for new adventures.